Every place has a story to tell but, with the passing of time, not all stories are preserved. The archaeological discoveries presented in this book afford a rare chance to hear from people whose voices would be lost, were it not for the opportunities for discovery afforded by the construction of the M8 Fermoy–Mitchelstown motorway, in north County Cork. 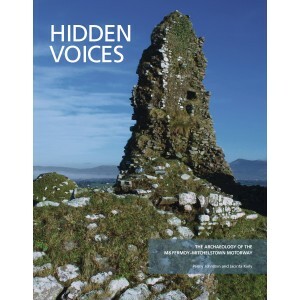 Hidden Voicesdocuments a major programme of archaeological investigations at 24 sites on the route of the motorway, which traverses broad plains of rich pastureland and the western foothills of the Kilworth Mountains. A diverse range of archaeological sites was discovered, representing the day-to-day life, work and beliefs of the communities who occupied this landscape over the last 10,000 years. Readers will learn of Mesolithic nomads fishing the River Funshion and of Neolithic farmsteads excavated at Gortore, Caherdrinny and Ballinglanna North. Bronze Age houses were found at Ballynamona, Gortnahown and Kilshanny, and a rare Iron Age example at Caherdrinny. Life in prehistory was precarious. There were burials at Ballynacarriga of Early Bronze Age women and children, including a young woman and her unborn child. But there was also the comfort of religion. Timber circles uncovered at Ballynacarriga are evidence of ceremonial practices in Later Neolithic times. An early medieval cliff-edge fort at Ballynacarriga, and cob-built houses and a blacksmith’s dwelling at Gortnahown move the story into the historical era. The iron-working evidence indicates highly specialised bell manufacture and brazing. The early 12th-century manuscript known as Críchad an Chaoilli provides a backdrop to these medieval sites, with its evidence for territorial boundary evolution and land ownership in the old kingdom of Fir Maige (Fermoy). The archaeological excavation accounts are augmented in this book by overviews of the settlement, plant remains, human remains, pottery, stone tool and iron-working evidence. Dr Penny Johnstonis a graduate of University College Cork and the University of Sheffield. Her research interests include a broad range of topics in cultural heritage, from oral history to environmental archaeology. She worked on the M8 Fermoy to Mitchelstown motorway project while a post-excavation manager at Eachtra Archaeological Projects. Jacinta Kielyis a graduate of University College Cork. She is a founder member of Eachtra Archaeological Projects and has worked on a number of national road schemes including the M8 Fermoy to Mitchelstown motorway.